Reaper "indoctrination" is an insidious means of corrupting organic minds, "reprogramming" the brain through physical and psychological conditioning using electromagnetic fields, infrasonic and ultrasonic noise, and other subliminal methods. The Reaper's resulting control over the limbic system leaves the victim highly susceptible to its suggestions. Organics undergoing indoctrination may complain of headaches and buzzing or ringing in their ears. As time passes, they have feelings of "being watched" and hallucinations of "ghostly" presences. Ultimately, the Reaper gains the ability to use the victim's body to amplify its signals, manifesting as "alien" voices in the mind. Indoctrination can create perfect deep cover agents. A Reaper's "suggestions" can manipulate victims into betraying friends, trusting enemies, or viewing the Reaper itself with superstitious awe. Should a Reaper subvert a well-placed political or military leader, the resulting chaos can bring down nations. Long-term physical effects of the manipulation are unsustainable. Higher mental functioning decays, ultimately leaving the victim a gibbering animal. Rapid indoctrination is possible, but causes this decay in days or weeks. Slow, patient indoctrination allows the thrall to last for months or years. I think the best place to begin this analysis is with the strongest pieces of evidence to support the idea that Shepard is being influenced by Indoctrination and move on to lesser convincing evidence that is still worthy of consideration. If anyone believes there is any important information or ideas/theories I have missed please let me know and I will be sure to add them. Bioware put a lot of effort into making the presence of this boy in the game important. Shepard watching him through a window is one the opening scenes of the game. Then after his death during the Reaper invasion Shepard has very strange recurring dreams of this child (see Section 2). These dreams include "ghostly presences" made of "oily shadows" and voices can be heard whispering that at times sound rather alien. 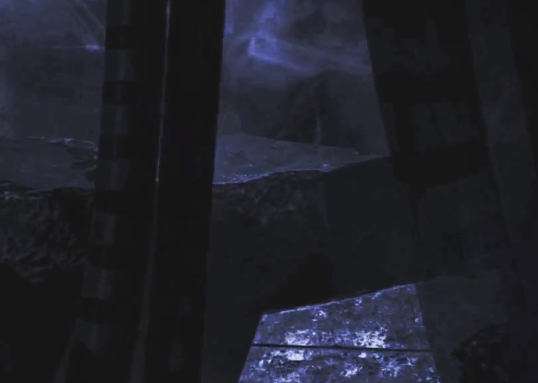 The codex mentions hallucinations of ghostly presences and alien voices as an effect of Indoctrination, the Rachni Queen mentions "oily shadows" as an effect. All rather tenuous of course, however when reaching the Catalyst Shepard meets a ghostly VI-like being that claims to be the Catalyst and manifests as the boy from these dreams. A boy that only Shepard has seen and should have no significance other than Shepard's guilt at not being able to save everyone. The Catalyst has access to Shepard's mind and chooses something familiar to Shepard to manifest as. In which case why does it choose to manifest as the boy Shepard feels guilt over? Is it to manipulate Shepard's choice? And is there any precedent for Reapers being able to read minds? That the meeting of the Catalyst is actually taking place in Shepards mind just like the dreams. Or the Catalyst is one of those hallucinations of ghostly presences the Codex mentions in regards to Indoctrination. It would seem that any of these conclusions at least give weight to the idea that Indoctrination is playing a role in this final event. We do not know the extent of the Catalysts abilities after all he does claim he controls the Reapers. He may simply be able to read minds and chooses to manifest as an image of someone the person feels sympathetic to. The fact this is not explained could just be poor writing. While there are a great many things that are strange between Shepard being hit by Harbingers laser and arrival at the Catalyst, it is the "decision chamber" itself that stands out as the most unusual to me. 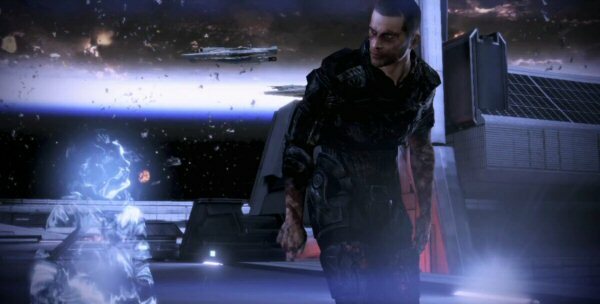 As soon as Shepard passes out trying to reach the control panel when Admiral Hackett calls to say nothing is happening (even though the arms are not fully extended yet), Shepard is bathed in a white light and a platform floats up to the decision chamber. Which just so happens to be in the place where Shepard collapsed. 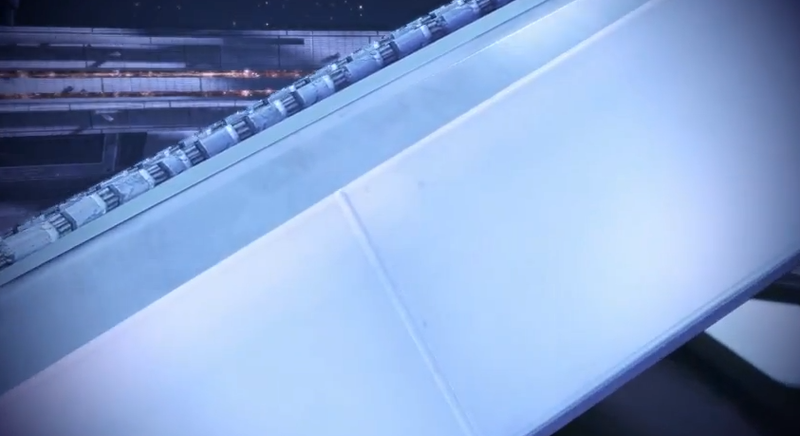 If you have a high EMS the Catalyst's first words to you are "Wake up", even though Shepard does not actually appear to be unconscious at that moment, just crouched on all fours in pain. If your EMS is low he says "Why are you here?". Everything the Catalyst says is echoed at the same time with the voice of both female Shepard and male Shepard, coming from the left and right speaker respectively. A clue that the Catalysts voice is in Shepard's mind? Even Shepard's words are echoed with whispers of Shepard's own voice. It all sounds very strange and unreal and gives the entire event a feeling of unreality. And for some reason Shepard for the first time ever does not question any of the information imparted. Shepard has no questions or doubts about anything the Catalyst says? Add this all to the fact that the Catalyst appears as the child in Shepard's dreams and you are hard pressed not to conclude something is simply not right here. Effects of Indoctrination certainly seem plausible. At this point Shepard is severely injured. This could easily contribute to experiencing things in a weird way, Shepard is barely even concsious at this point. So what does this mean? Well it can only mean one of two things as far as I can tell. At some point Bioware intended there to be trees in this section but removed them. However they forgot to remove them from the reflections. 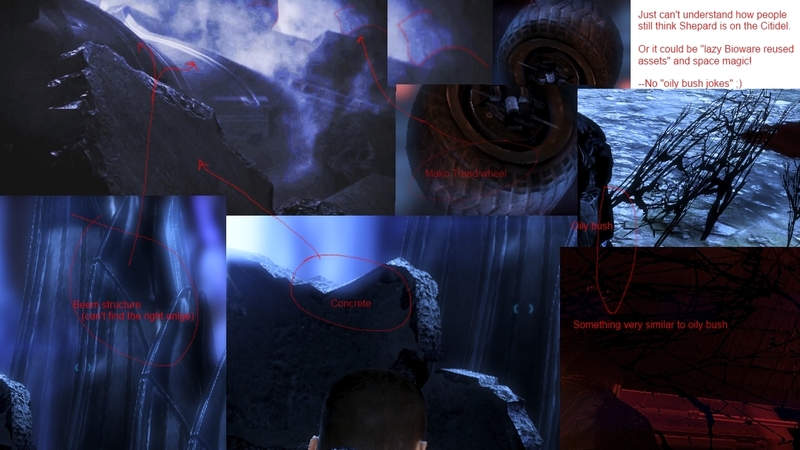 Bioware intentionally left the reflection of trees in this section to both reference Shepard's dreams and as a clue that this is a dream-like-state. Interestingly this area is refereed to as the "Guardians garden" in the leaked script. Could it be these were originally going to be in this scene? 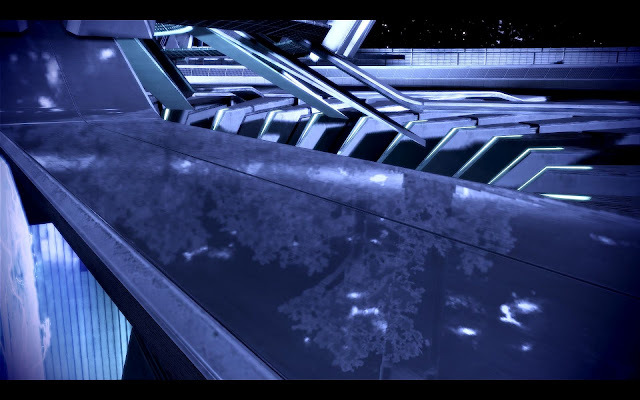 Whether these trees were ever meant to be part of the scene or only a reflection, it does seem to be a pretty big intentional clue that this scene is directly related to Shepard's dreams. When you have trees from Shepard's dreams and the boy from them, you have to think there is an intentional link. Bioware made a mistake, the trees are there by accident. Maybe originally the "Guardians garden" was more garden like, and the connection to the dream is merely a coincidence. This to me seems to be one of the more obvious clues to the likelihood of Indoctrination. The Catalyst offers Shepard 3 choices to "end the cycle". It surely cannot be a coincidence that of the three choices two of them were previously proposed by people who were Indoctrinated. Control - The Illusive Man's choice. A decision we know he was led to during his Indoctrination. We also know that a group of Prothean's also believed the Reapers could be controlled and they turned out to be indoctrinated too. Of course the Catalyst assures us that Shepard could actually control the Reapers for real this time. Synthesis - Sounds very close to Saren's choice. 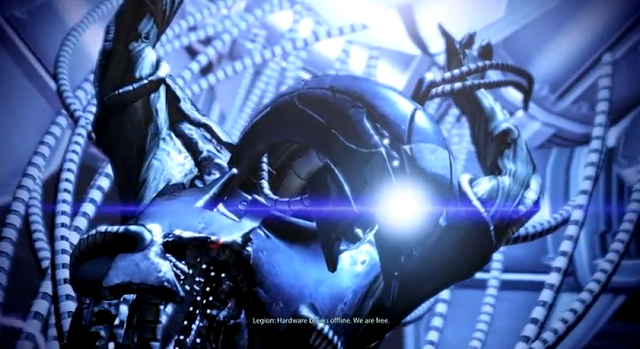 At the end of Mass Effect 1 Saren talks about how we can avoid being destroyed by the reapers by joining with them. To quote "organic and machine intertwined, a union of flesh and steel. The strength of both, the weaknesses of neither. I am a vision of the future, Shepard. The evolution of all organic life. This is our destiny". Almost exactly how the Catalyst tries to sell Synthesis to Shepard. Destroy. Shepard's choice. At least up until this point. So we have two choices that keep the Reapers alive and are also known as arguments the Reapers have used to slowly and subtly Indoctrinate beings in the past. While the final choice destroys the Reapers. The argument that this is an attempt at Indoctrination and that Shepard's only resistance to the Indoctrination is to choose Destroy seems pretty strong. Also the Catalyst does his best to paint the Destroy option in the worst light, not only will the cycle continue and we will be doomed to repeat our mistakes and be destroyed by Synthetic life in the long run. But it will kill all Synthetic life existing now, essentially committing genocide against the Geth and killing EDI too. And not only that, he ups the ante even more by saying even Shepard is partially Synthetic. Strongly Implying that Shepard will die along with anyone else that has Synthetic implants they rely upon to live. However we know for a fact that the Catalyst is lying here. Not only can Shepard survive with enough EMS but it has been claimed by many (but not confirmed yet) that EDI can emerge from the Normandy. Also if this is not strong evidence that two of these choices represent some form of Indoctrination attempt, then why is it that only with the Destroy option (the one we are told is the worst) can Shepard live? If Destroy is the "Best Ending" and the other two options are giving in to Indoctrination, why is it that Destroy is the only option you get with very low EMS? Even though Shepard cannot live with such low EMS (and Earth is destroyed) why is it you can not only still resist Indoctrination, but resisting is your ONLY choice? Wouldn't it make more sense that Shepard would be unable to resist Indoctrination if that is what was going on? 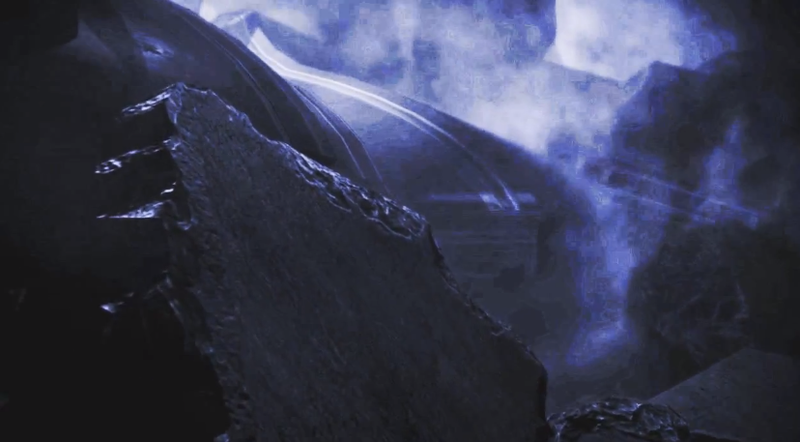 Or is it that with such low EMS even Destroy is giving in to Indoctrination simply because Shepard dies and Earth is destroyed (at least in Shepard's mind, giving way to despair?). Could it be that the reason you have such low EMS is because you did not do most of the side missions, meaning you rushed through the game. Meaning the Reapers had less chance to Indoctrinate you? Or maybe with such low EMS you are going to lose the battle against the Reapers anyway, so they don't really care if you are successfully Indoctrinated. They have already won. With a high enough EMS when choosing Destroy we are treated with a final cut-scene before the credits that shows Shepard "wake up" and take a deep breath. Revealing that Shepard is alive and has survived. I have already mentioned the fact that this takes place only after choosing Destroy is a good argument for some element of Indoctrination. But there is another reason this scene adds considerable weight to the Indoctrination argument. 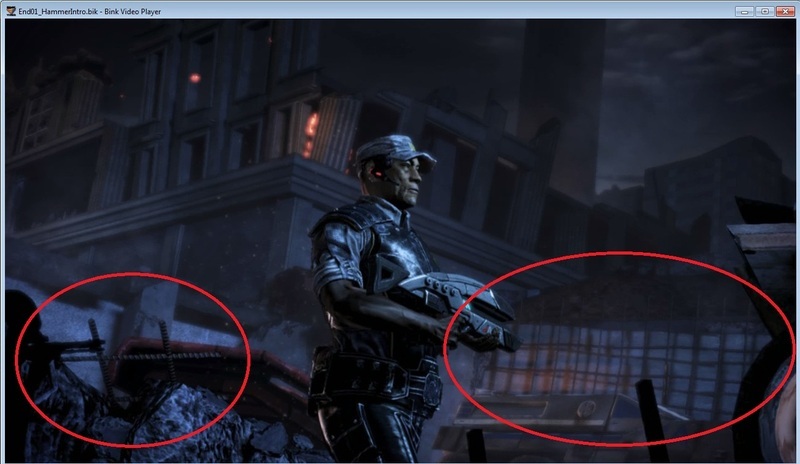 Why is it that Shepard appears to be lying among concrete rubble? If Shepard is waking up on the Citadel then why were sections of a space station constructed by such advanced civilizations made with such a primitive material? Surely a space station would be made of light materials. It certainly all appears to be metal at every other point in the game. One version of The Indoctrination Theory argues that Shepard is actually waking up in London after surviving Harbingers laser and having dreamt/hallucinated everything else as part of a a heightened Indoctrination brought on by Harbingers presence. This makes sense insofar as London is a place where concrete is not only common but concrete rubble and rebar looking almost exactly the same as that seen in the breath scene can been seen all over those final parts of the game. If Shepard wakes up in London then it seems logical that Shepard was never on the Citadel and all that was a dream/hallucination. And we SEE the Citadel explode! If it's supposed to be the Citadel then how the hell are we supposed to believe Shepard survived that? How does Shepard survive this? It certainly could be that some parts of the Citadel ARE made of concrete and what appears to be rebar is actually the cables from the Citadel. 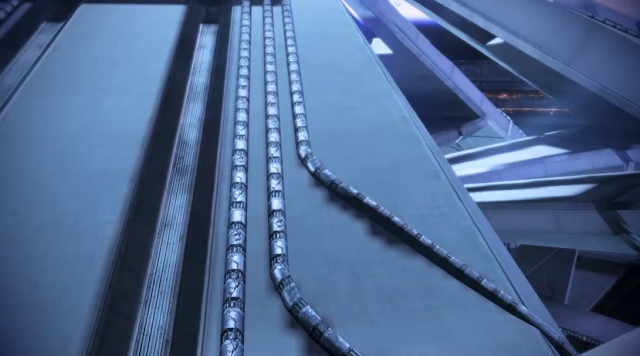 The cables in the Citadel and Decision Chamber look very much like what is being claimed to be "rebar". Cables in London? Or rebar? 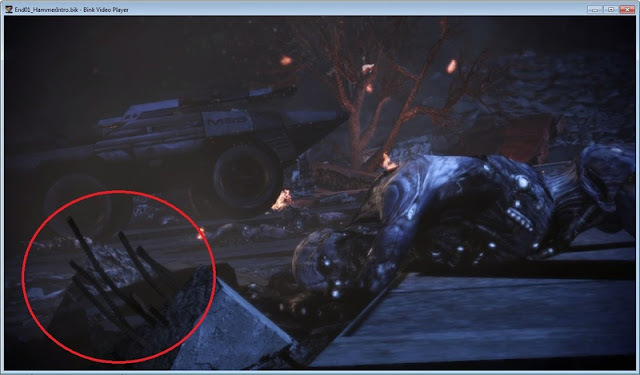 And the rebar/cable looks a lot like the cables from the Reaper tech Legion was plugged into. So it could just as likely be cables as rebar. 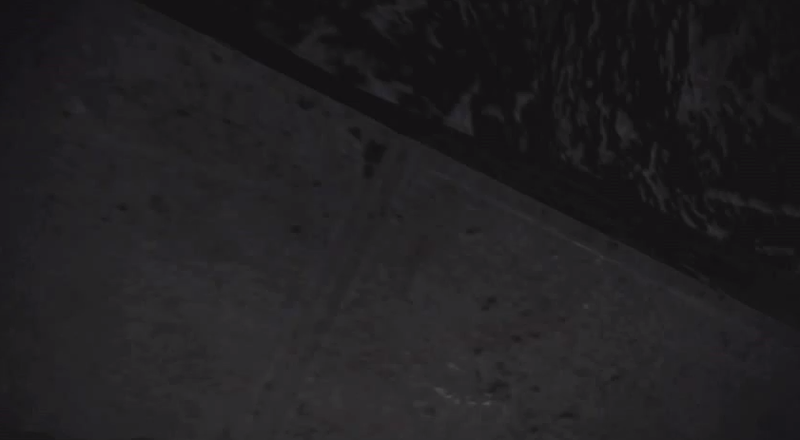 Also someone used a hack on the PC version to activate a flycam in the Decision Chamber that was able to identify not only similar cables but something that has grooves on it that bares a strong resemblance to the grooves on the concrete in that final scene. Just because it seems unlikely that a space stain has no concrete on it, doesn't mean it doesn't. Also just because it looks like concrete doesn't mean it is. Also what is this thing? Not the concrete rock at the front but the shiny fabricated object behind it. It looks like something that would be found on the Citadel but I have been unable to find an exact match. Or maybe it's part of one of the Alliance vehicles that charged the beam? If we can identify it we may be able to put this mystery to rest at least. I myself have noticed it bares some similarity to the "Beam Structure" but have been unable to find an exact match. Someone over at BSN made this comparison image which also includes a good comparison of the other strange object to an overturned Macko. Conclusive? Not at all, but the most compelling identification so far. I don't know if this is relevant, but the trees that appear in Shepard's dreams seem dead, or at the very least, devoid of leaves. But the trees that appear in the reflections on the Citadel are lush and full of leaves. This might lend credence to the claim that the trees are there by accident. Hey. I am a huge fan of IT theory. You have done very good job collecting all the evidences, huge respect goes to author of this blog. One thing I found very weird during my own play through of this game was: not only the boy survived after he ran into the building (assuming he survived) but he also doesn't seem to have no bruises no debris on his cloths, basically he was untouched by massive explosion. Shepard is a military man, very tough, and he was knocked out when reaper hit the Defense Council during first minutes of the game. I also thought it was weird and strange when Anderson interrupts your conversation with the boy you hear Reapers growl and Anderson has this look on his face like: "Shepard wtf, who are you talking to lets go we got to move". But it might my personal perception of this scene. I would like to know your opinion on the look on Andersons face or is it ok for this boy to talk the way he talked to Shepard? Good points. I agree on all of them. Do I not mention the Reaper growls? If not then did not realize that I had not mentioned them. I need to do that. Very good points in both posts. 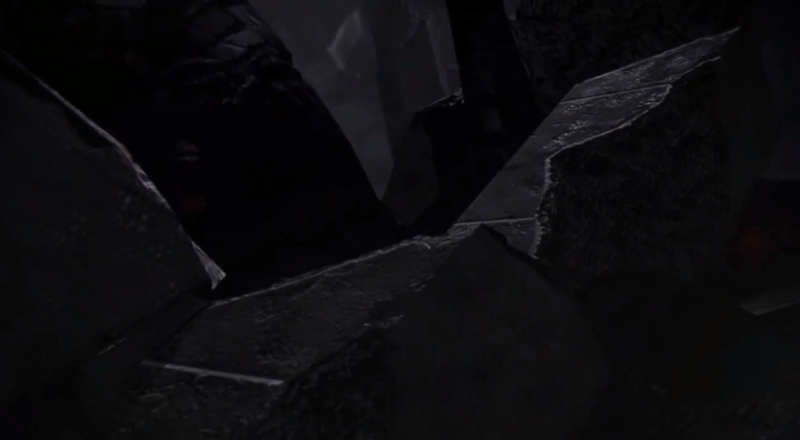 There was something weird about the kid from the very beginning and when Shepard looked back in the vent he wasn't there anymore, even though it didn't seem to lead anywhere. Brilliant explanation, thanks! One more thing though: the colors attributed to the choices. Destroy has the Renegade color and Control has the Paragon color, as if to confuse Shepard as to which is the optimal choice. That right there is the main thing that led me to believe in the IT and I doubt it's not intentional. I like to think the indoctrination began when Shepard was in the vehicle on the way to the beam, and when they crash it blacks out then your standing getting ready for the charge to the beam. He got knocked out, thrown into the rubble (somehow, don't have it figured out yet), and the indoctrination became stronger in his knocked out state. sorry if this posts twice... I think he (or she, i guess) is just mentally exhausted, and knocked out. Maybe its a sign of him/her being indoctrinated by something else. Maybe in ME5 we'll need Shepard to snap awake in a London hospital with a clear mind of what needs to be done to accomplish some unknowable future task. yeah, you did. you (all) thinking about game, but its about us and our time. about humanity and cyclus, we must be destroyed in order to bring order to the chaos.